"25 øre bicolored I. printing, isolated inverted frame pos. A77 with good centring and light numeral "17" Fredericia." 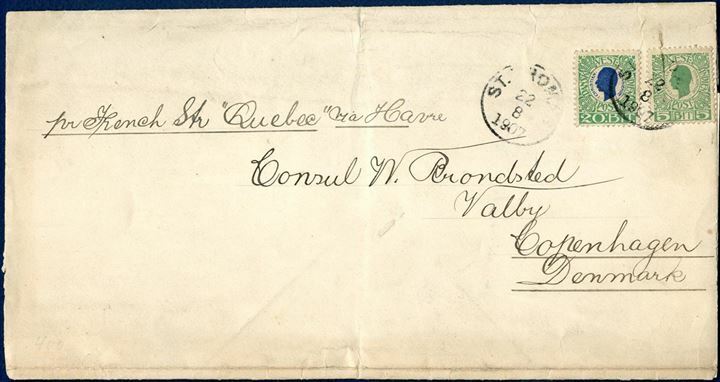 Under franked LOCAL letter with 10 øre wavy-line sent from Copenhagen to Julianehaab 18 March 1940. Endorsed “10” blue crayon and paid in Julianehaab with a 10 øre King Chr. X stamp tied by Julianehaab CDS April 1940. The letter was sent by one of the last ships to Greenland before Denmark was occupied. Rate to Greenland 15 øre, double the missing postage of 5 øre is 10 øre due by the addressee. First issue Greenland rarely used as postage due stamps. Transition period 1917. Two postcards from the same sender and to the same addressee, sent with a DWI stamp the last day 31 March and with US stamp the 2 April 1917, very interesting and historical post cards. Printed Matter Wrapper Band sent from St. Thomas to Copenhagen 22 August 1907 on “pr. French steamer “Quebec” via Havre” in manuscript with Copenhagen arrival mark 9.9 on reverse. 25 BIT pays for 5th weight class of printed matters, extremely scarce letter with the Kings issue. 20 øre essay for the 1944 Church issue in black on large paper 145 x 133 mm with impression of the copper block. Fine quality of a rare essay. Royal Service letter sent from Cismar to Neustadt 14 December 1859 with “Cismar, 14/12 60” 1-line mark applied on front alongside “Lensahn” CDS. ARGE type 6. Entire letter from St. Thomas 26 July 1876 to Carupana, Venezuela. Routing instruction Pr. Ville de St. Nazaire, via Fort de France. 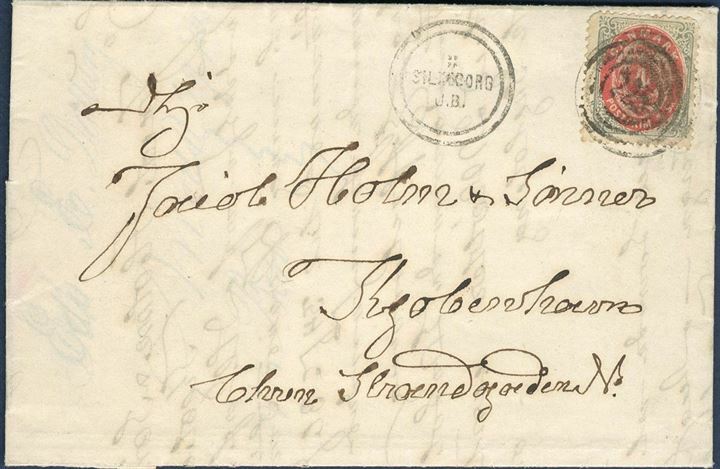 Delivered to the Danish Post Office and with cds ST. THOMAS 27/7 1876 struck on front. Franked with pair of 30 centimes REPUB FRANC tied by octagonal ST. THOMAS PAQ. FR. B. NO. 4 27 JUIL 76. Unsual with both ship’s name and routing port Fort de France. Royal Service Letter “K.D.S. mit Attest” sent from Bordesholm to Meldorf 13 August 1860, alongside town manuscript “Bordesh. 13/8” with railway mark “Elmsh-Itzeh.Ebn.Post. Bur:” CDS on reverse. 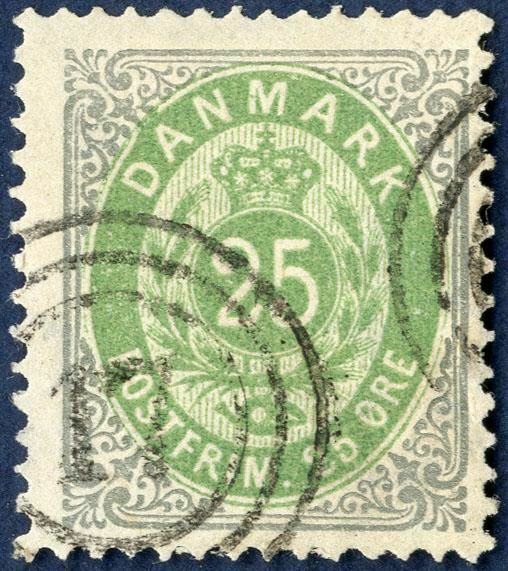 Market-report sent from Haderslev to Flensburg 24 May 1867 bearing a 1/2 Sch. “Schleswig-Holstein” tied by 1-ring “HADERSLEBEN 24 5 67 6-7N”. Correct postage. 2 Rigsbankskilling, Thiele printing, Plate I, pos. 95, type 9. The NEWLY DISCOVERED error with think throat on figure 2, listed in AFA Denmark as 2by. Only 1 in 200 stamps, with wide margins. Franco letter sheet dated Aalborg 4 September 1852 via Frederikshavn to Horten, Norway. Postmark – K.D.P.A. AALBORG. 4/9 – struck on front, and then from Frederikshavn directly to Norway. Straight line mark – Frederikshavn. – 28mm applied, extremely scarce postmark. 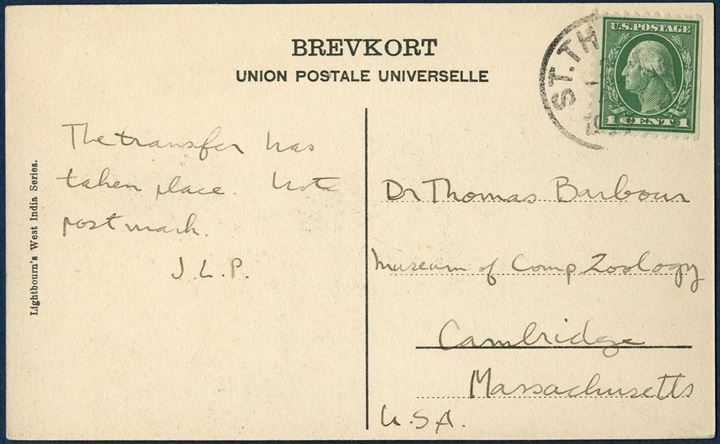 Registered envelope Frederiksted 7 October 1915 to New York, USA. 50 BIT King Christian IX tied by CDS “FREDERIKSTED 7/10 1915”, registration mark “Frederiksted / R / 1836” 9. Registration fee 25 BIT, UPU rate 25 BIT from 1.10.1910 – 31.3.1917, correct franking. Letter from Skive 7 October 1854 to Copenhagen. Postage paid with 4 RBS THIELE III printing, greyish brown, tied by numeral 54. The datestamp ANT III-1 was submitted for alteration into ANTIII-2 and during this period the manuscript town name is recorded from 4.10 – 20.10 1854. Scarce. Postcard from Christiansted 29 november 1906 to Hellerup, Denmark. 10 BIT red I. printing King Christian IX tied by 4-ring cancel without dot used at St. Thomas for arriving shipmail from Christiansted and origin mark C large type struck on front, with ST THOMAS 29/11 1906 LAP on front. Instruction to the post JULEAFTEN for delivery Christmas evening and routing instruction BY/GERMAN STEAMER. UPU postcard rate 10 BIT from 15.7.1905 – 31.12.1909. Entire sent from Frederiksborg 15 May 1851 to Helsingør, bearing a 4 RBS Ferslew plate I, pos. 30 tied by mute cancel. Antiqua Frederiksbrog appears as month is a “3” instead of 5. 1 CENT bicolored issue (1900), frame main group 5, green, imperforate color proof with large margins, without gum and watermark. This proof may very well have been made in preparation for the 1¢ green Coat of Arms issued early 1900. Only two recorded. "Folded letter sent from Hamburg to Sondershausen 18 march 1807. Stamped with BGD "HAMBURG. 4 / B. G. D. 18 MARS. 1807" Arge 21, not listed with the frame. Very clear strike in red." Letter sheet stamped “ST THOMAS / Aug 2 / 1813” British fleuron mark, sent to London and backstamped circled “D / 9 SE 9 / 13”. Charged 2/2. Single packet letter rate 1/2 (1813-37), to London 1/ (Falmouth-London 1812-39, 200-300 miles), total rate charged 2/2. Letter privately carried on board the steamer “Jutland” to Copenhagen from Hull 19 March 1863. The “Consignee letter p. Jutland” then handled by the shipping agent “C. K. Hansen” and handed over to for postal service. 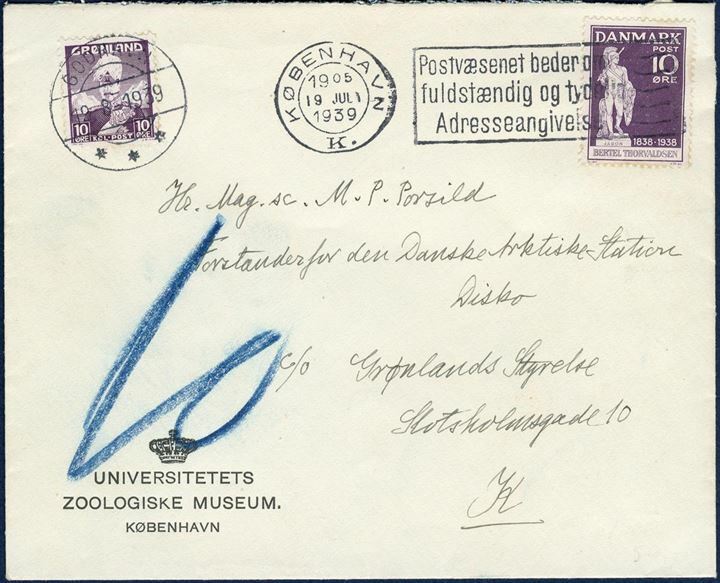 The post stamped the letter “SKIBSBREV - KIØBENHAVN”, charged with 15 sk. in red crayon. The postage calculated as 9 sk. for a ship letter and then 6 sk. fee to the ship. Rare.